Replastering your swimming pool is easy and affordable with our team of pool plastering experts. We ensure that the pool finish is perfect and your swimming pool will be beautiful throughout the years to come. Call us today for a free no cost estimate and we will come to your location in Charleston to test and inspect your swimming pool finish. You will receive a full report of the pool surface and water quality along with a free estimate to remodel or replaster your swimming pool surface. It’s fast and easy to replaster your swimming pool! Most pools and spas are completed in just a couple of days. We are licensed by the state of South Carolina for all commercial and residential projects. The etch resistant marcite alternative, are a mill prepared marcite alternative blended with the highest quality selected colored quartz aggregates, white portland cement and proprietary additives to enhance strength, density, bonding and curing. Charleston Pool Experts provides plastering with a Gem Finish that will yield a hard, long lasting surface highly resistant to stains and spot etching prevalent with traditional pool plastering. 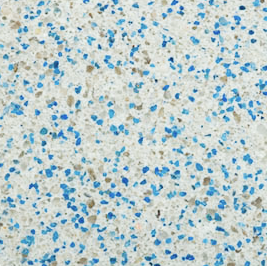 Exposure of the aggregate produces a safe, slip resistant and non-abrasive surface that attains a compressive strength in excess of 3500 psi in 24 hours and exceeds 7000 psi in 28 days. Suitable for application over gunite or shotcrete substrates which are free of foreign matter, e.g., dirt, grease, oil, dust, etc. If an acid wash is used to rid the substrate of foreign matter, neutralize with a solution of soda ash and water. If the project is a renovation, Florida Stucco’s POOL PREP is an excellent preparation material to be used in conjunction with Gem Finish. Use only clean, potable water. Approximately 1.5 to 2 gallons of water per 80-pound bag can be used to bring the mix to a lump-free consistency. Allow the mix to agitate in the mixer for 10-12 minutes to provide best workability. Gem Finish is a complete product; addition of other materials is not necessary. Apply Gem Finish over a cement base that has been dry for a minimum of 24 hours. 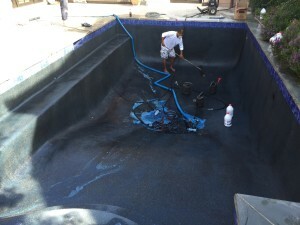 The pool’s walls and floors must be evenly sprayed with water before application to reduce suction. Gem Finish should be applied to a thickness of 3/8″ to ½”. Application is best accomplished by mechanics that adhere to the professional standards of the plastering industry. Depending upon prevailing weather conditions exposing the Gem Finish surface can begin shortly after finish trowelling or up to 12 hours later. Factory trained personnel are supplied when requested with initial use of Gem Finish. These personnel can supply instruction in the exposing phase of the Gem Finish installation. Filling the pool with water may begin upon completion of the exposure phase. Florida Gem Finish will yield approximately 3-5 square yards (27-45 square feet) of material per 80-pound bag. All materials used in the manufacture of Gem Finish comply with ASTM C926-86 and ANSI 2 1971.